Urban Outfitters Fishbowl Drinking Kit, Urban Outfitters. Sharing is caring and the fishbowl is the ultimate group activity. This kit helps you build the classic drink for four. Urban Outfitters Electric Juicer, Urban Outfitters. A cocktail is nothing without fruit. Keep it fresh, but simple, with an electric juicer for limes, lemons and everything in between. Anthropologie Bottoms-Up Bar Shelf, Anthropologie. If your bar space is tight, clear some room with a shelf. This one is guaranteed to fit your collection with bottle holders and wine glass slides. Imagine the cocktail. It’s classic. It’s glamourous. It evokes a time gone by, like the ‘20s or the ‘50s. Crafting the perfect cocktail at home is a luxury that requires many goodies. 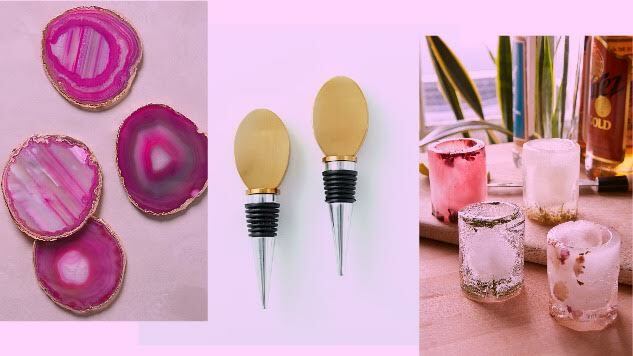 In honor of National Cocktail Day, we’re showing you some stylish swag to stock for your at-home bar. Peruse the gallery above, and get to shaking. Cheers!